Halloween has never been one of my favorite holidays, but there IS one thing I like about it: the carving of Jack O Lanterns. And as you may recall from way back near the beginning of my blog in my photo essay The Reincarnation of My Jack O Lantern, I am not above cooking it up into food the day after it lights the way for the ancestors and the spirits seeking the light. This year I wasn’t sure I could pull that off, being at the beach and not having a sure fire way to lug a carving pumpkin home down North Highway 101. In fact, I thought I wouldn’t. But then, as so often happens, synchronicity won the day. On the Sunday before Halloween, some great new friends here asked if I would like to accompany them on a trek to Fred Meyer down the coast a ways. Of course I was game since my supplies were running slow. It had been raining pretty consistently for most of the week, and Sunday was no exception. It began to let up for a bit as we drove down the coast, and we were treated to the sight of a gray whale spouting, then showing its back and finally its tail as it dove deep, very close in to Depoe Bay Harbor. It was meant to be, including the empty parking spot we pulled into spontaneously to be sure to get a really good look. When we got to the store, the rain had turned to drizzle, and made the huge display of pumpkins outside the front entrance a deep beautiful persimmon orange. I gasped in appreciation and remembered my jack o lantern fetish. But still I didn’t think to pick one out. With two dogs and all the transitions I’m juggling back and forth between the beach and the city, I didn’t think I’d have it in me to carve one. And the tools I usually use were back in my condo anyway. But once I was let loose in the produce department, I walked past a display of little sugar pumpkins on sale. They were so darn cute I couldn’t resist. Perhaps just a baby jack o lantern was somehow in my stars. Sugar pumpkins are meant to eat and surely the skin would not be quite as tough, no matter my lack of favorite implements. Still when I got home with my plant-based loot, I didn’t commit. I put the little pumpkin on the small butcher block table in the kitchen next to a bowl of apples and a delicata squash, along with a tea light in a mason jar, and waited to see if the right moment of will to carve came to me. And it did. Lunchtime on Halloween was preceded with the carving of this simple spirit baby jack o lantern, in memory and honor of all things small and seemingly unseen that are really not so small, those that have come before, and those that will come at some unknown time. Here she is, all aglow and ready for dark to fall. If you look carefully you can see a small scrap of the ocean out the window behind her. She cast a beautiful light for any wandering spirits that may have drifted to shore, but that didn’t stop me from carving her up the next day and roasting it. You can see how it became part of my lunch in the top photo. But the mainstay of my beachside lunches I’d like to share with you today is the easy oil free kale chips I’ve come up with. I’ve always been a person who enjoys crunchy things, but as I get older commercially toasted anythings often do not agree with me at all. I also did not want to coat my kale pieces with a lot of high fat ingredients. I tried a lot of things and in the end I came up with this very simple formula. It’s not salt free, but you could alter it with other spices if you want to. 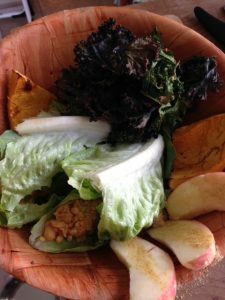 The other things in my lunch bowl are simple as well: apple slices sprinkled with ground ginger, roasted pumpkin pieces (au naturelle, nothing on them at all), and big romaine leaves filled with smashed chickpea spread. I offer them to you here, and hope you enjoy experimenting with the ingredients in a way that suits you. They each take only minutes to prepare, but are flavorful and diverse in color and texture, things I really appreciate in a meal. Put the torn kale leaves in a salad bowl. Mine usually have a little moisture from being sprayed in the grocery store or washed, and that’s all I need to get the spices to stick to them. Sprinkle the garlic granules, nutritional yeast and gomasio onto the leaves. Toss with your hands like you would a salad, until the spices are stuck to the leaves. Lay them out on a baking sheet lined with parchment paper and bake in an oven 375-400 for about 8-10 minutes. They will be light as feathers and very crunchy. And a bit salty, but not too salty, like the fresh sea air. Combine everything in a bowl and smash the chickpeas with a fork until as many of them as you want are smashed and there is a spread-like consistency. If you need more liquid use some of the liquid from the can or from your cooking. Good in a sandwich or a lettuce wrap or even with apples. Gets even better after it sits in the fridge for a while. Happy In-Between Halloween and Thanksgiving, Everyone! Thank you so much for these recipes Maria. We had quite a wet winter (unusual for S Australia – we are the driest state on the driest continent apart from Antarctica) and I have a fair amount of kale growing in my garden and to be quite honest I don’t like it very much but waste not want not : ) So kale chips it is! 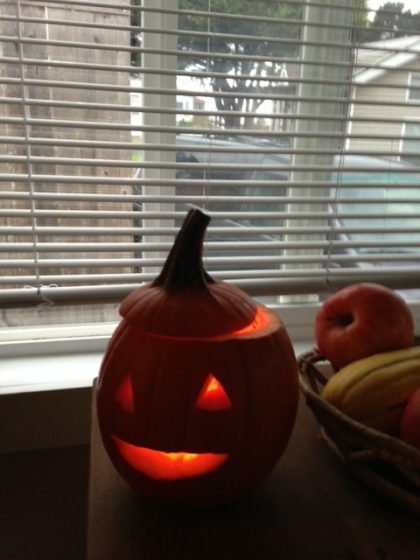 I’m not a big Halloween lover, either, but I adore your little jack o’lantern! 🙂 And I like how you made the kale chips oil free- I’ll have to try that method. I make a similar chickpea spread, but with no tahini or miso and lots of fresh dill. I’ll have to also try it with the miso & tahini! That would definitely add a bit more flavor and depth. Thanks for the ideas!